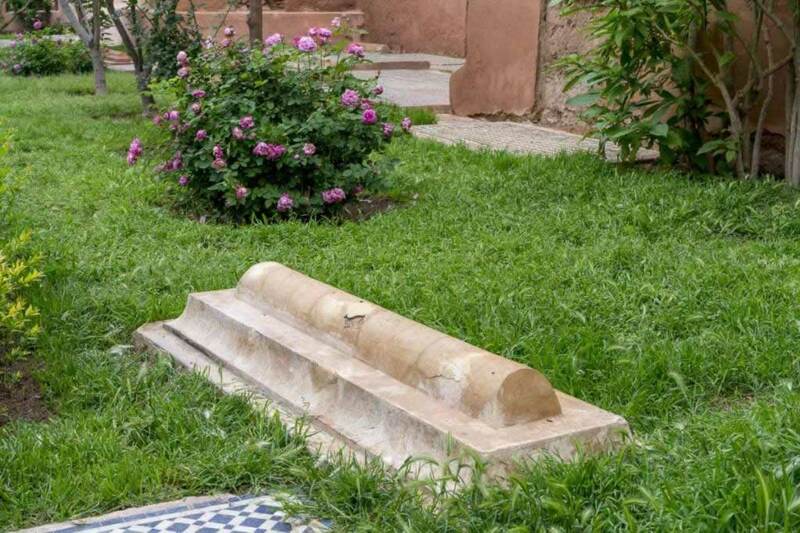 The Saadian Tombs in the Kasbah of Marrakech - Worth Visiting or Not? As weird as it may seem, I enjoy visiting graveyards. 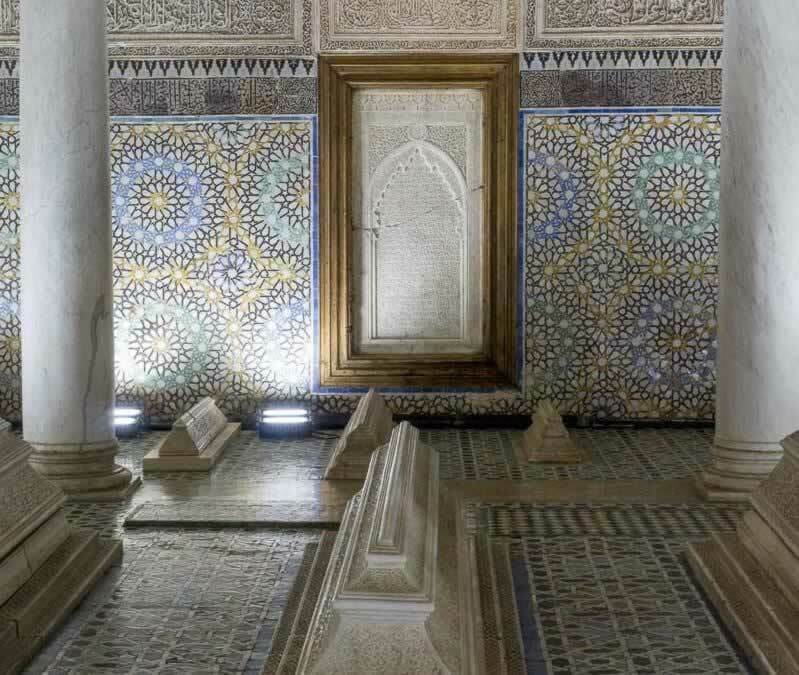 While planning my trip and researching the best things to see in Marrakech, I came across the Saadian Tombs. The next move was to add this landmark to my bucket list. It was one of my best decisions in regard to this trip. 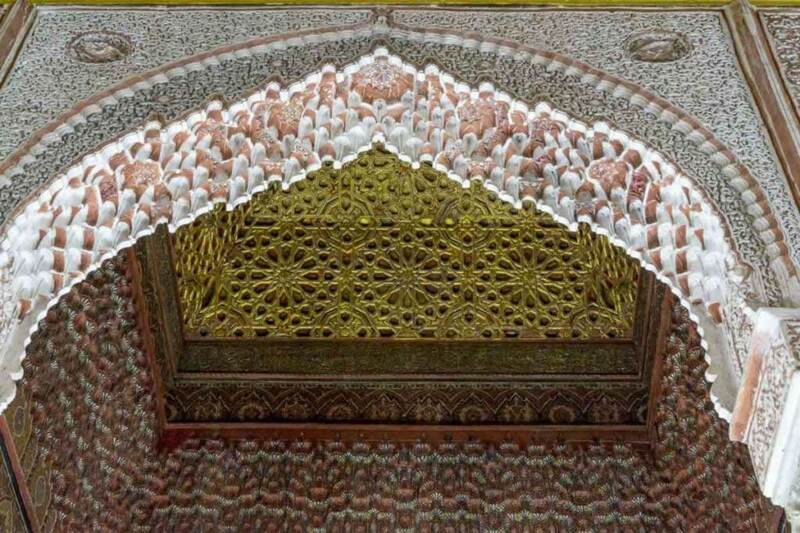 The Saadian tombs are in an enclosed space, inside the Medina. As you get to Djemaa-El-Fna square, walk along the souks until you reach the Kasbah Mosque. As you face the mosque, you’ll see a narrow entrance to the far right corner. It’s not very obvious, but you’ll have lots of people around to ask for guidance. The mosque is very beautiful, but non-Muslims aren’t allowed in. I’ve only managed to peep briefly as people were rushing in for the prayer. 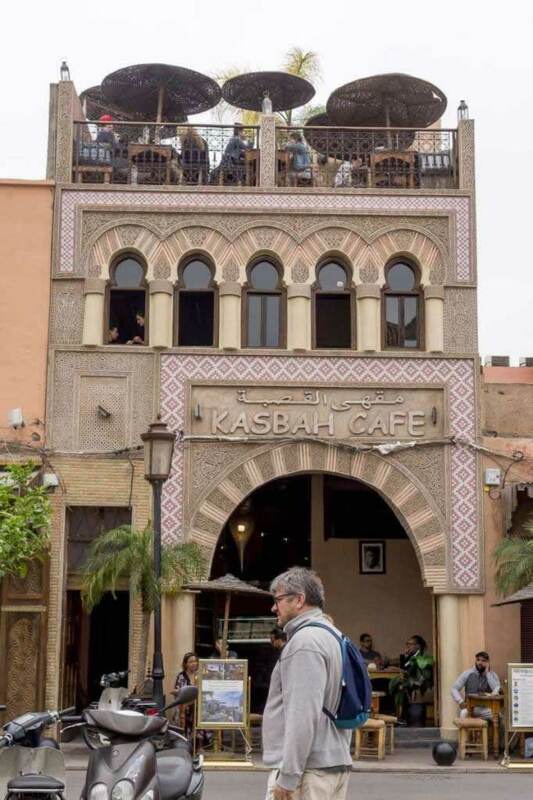 The Kasbah Cafe in the photo below is very close to the entrance of the necropolis. This shop is also very close to the Saadian Tombs. If you can’t see the entrance, just ask the sellers for directions. That’s what I did. They showed me the way and made me a discount on some fancy Marrakech souvenirs (which I didn’t buy). This necropolis is everything that’s left of the Saadian dynasty that ruled over Marrakech from 1524 to 1659. Unfortunately, during the 18th century, the rulers that followed (namely Sultan Moulay Ismail) decided to destroy all remaining vestiges of the Saadian dynasty. 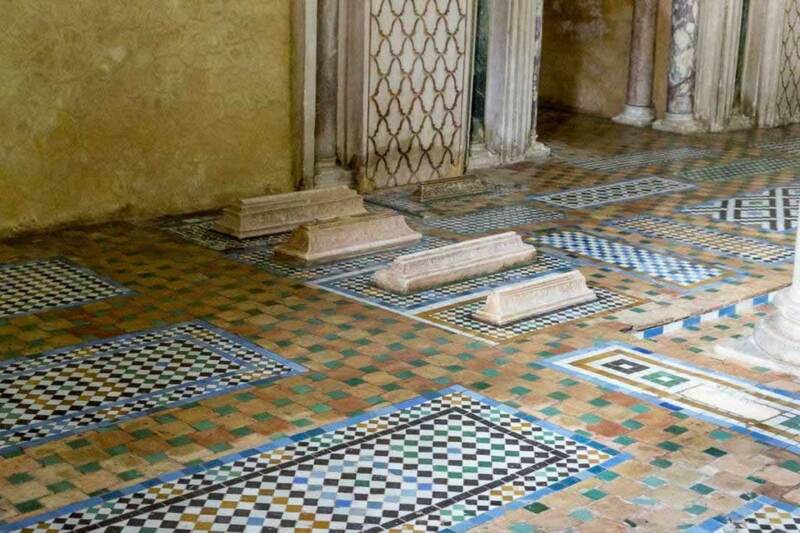 As much has he wanted to erase all signs of the Saadian civilization, the sultan was afraid to touch the dead people, so le left these tombs and the buildings untouched. He rather had the entrance to the burial site sealed up, so that nobody would ever find it. The secret was discovered only in 1917. The restoration team did an amazing job at bringing these monuments back to light. The outside tombs are scattered along a beautiful lawn. There are small trees and colorful roses everywhere. As you can see, the tombs have different shapes and sizes. I think each of them is unique. At 10 dirhams (the equivalent of less than $3 US), this is one of the least expensive cultural and historical landmarks you can visit in Marrakech. You don’t need more than 30-45 minutes to see the whole thing, but you should factor in about 30 minutes of doing the line to see the Hall of Twelve Columns, home to the tomb of Ahmed El Mansour, the Sultan’s son. It is worth the effort, as the stucco works and the wooden ceilings are awesome works of art. The burials are made of Carrara marble. They have different sizes and they bear various epitaphs. 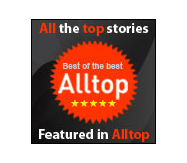 I recommend you to get a guided tour. I didn’t, so I had to read more about the history and the features of this necropolis afterwards. 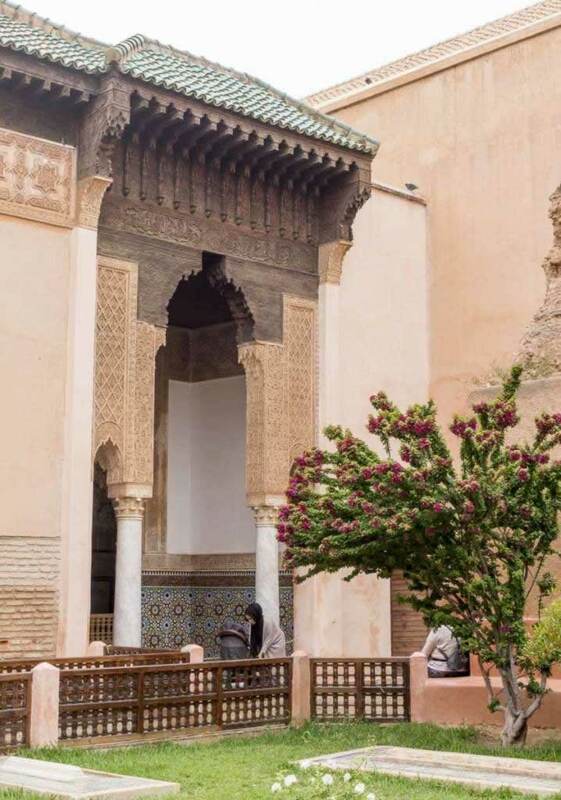 If you want to go with a professional guide, check out this link to a half day cultural tour of Marrakech that includes the Saadian Tombs among other objectives. 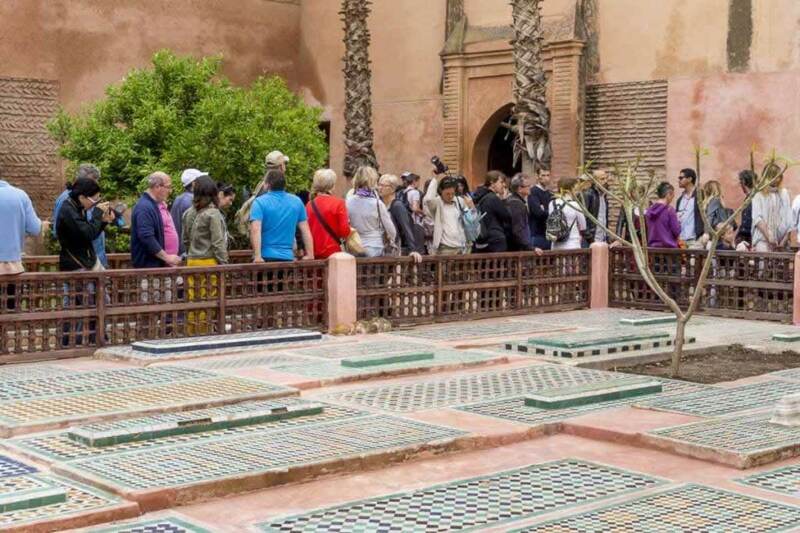 The visiting hours of the Saadian tombs are from 9am to 5pm. Take one hour for this visit, in order to have enough time to enjoy this peaceful site. Unfortunately, there will be hundreds of people wanting the same thing. This will kill any attempt at quiet meditation. As far as I remember, we’ve been there in the morning. We didn’t wait more than ten minutes at the main entrance. However, as you can see, there was a small crowd doing the line to see the Hall of Twelve Columns. Don’t imagine that you’re going to get inside the Hall of Twelve Columns once you’ve done the line. You’ll only be able to look through the narrow doorway and take some photos of the interior (which is impressive, by the way). Here’s the couple in front of me taking their photos while I couldn’t believe that I waited for almost one hour to do the same. 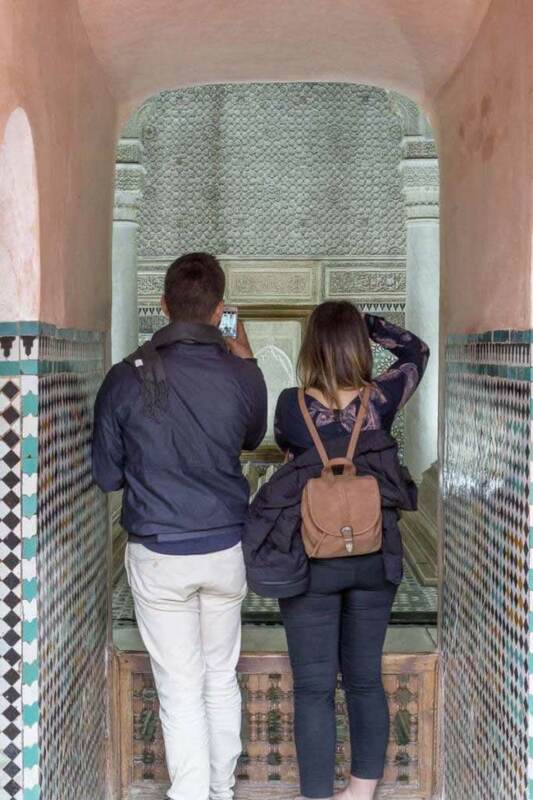 Are the Saadian Tombs Worth Seeing? My answer is a big YES. Everything you’ll see inside is a magnificent piece of art, perfect to the tiniest detail. 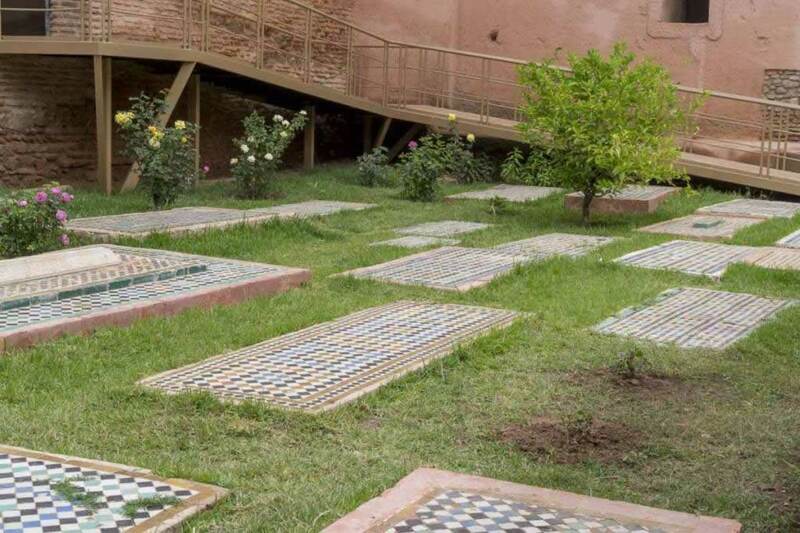 There are about 100 tombs outside, in the gardens, and about 60 inside the two mausoleums. This site was built in the same period with the Ben Youssef Madrasa which is currently closed for renovation. 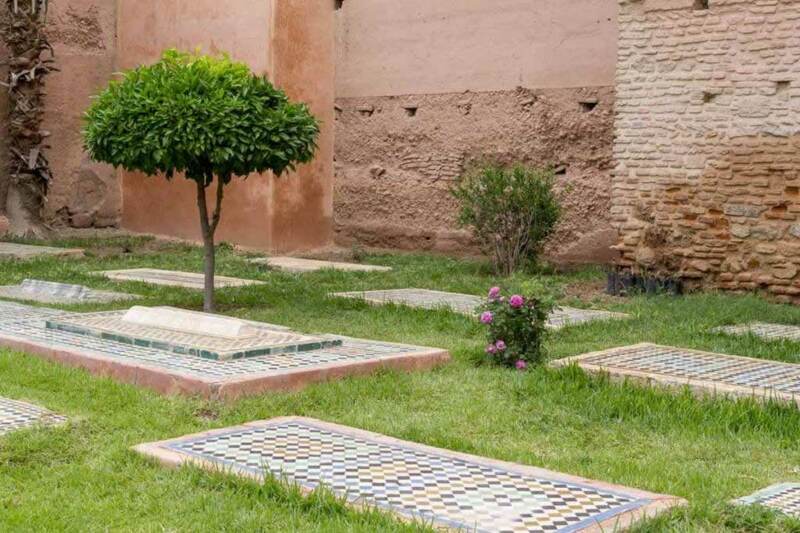 By visiting the tombs you’ll make yourself an idea about the architecture and the style of that period in the history of Marrakech. Just like in Majorelle Garden, I imagined the Saadian tombs to be huge. 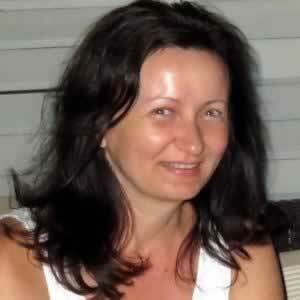 I was afraid several hours wouldn’t be enough to visit them properly, to relax and to take photos. As a matter of fact, both Majorelle and the Saadian tombs are rather small. You can safely get inside one hour before the closing time and still see everything. Apparently, getting there first thing in the morning can help you avoid the crowds. The Saadian tombs are in a relatively small enclosure, so being surrounded by dozens of people may spoil your experience. However, with or without the crowds, you’ll get a gist of the Saadian civilization and of their way of building things. I wish today’s builders were this concerned with creating this kind of beauty that lasts. Thank you. 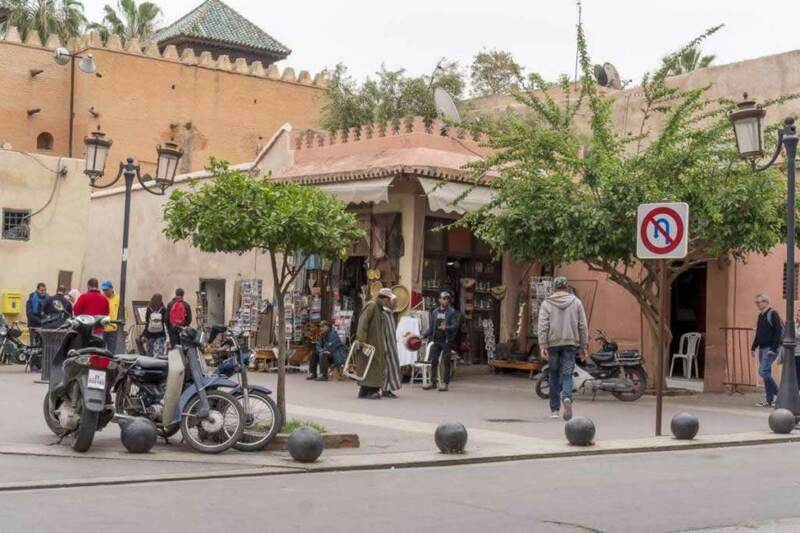 Indeed, that’s a great spot, a must-see for all Marrakech travelers.